Martin Khor is executive director of the South Centre. THE new government is undertaking extensive reviews of the economic situation and policies. The scope of the reviews is comprehensive and the pace is fast, with a 100-day deadline. This is commendable as the policies need re-looking, spring cleaning, and in some cases an overhaul. One area requiring urgent review is trade policy and trade agreements. This has not yet had the attention it deserves, maybe because a trade minister has not yet been appointed. Exports play a prominent role in the economy, and what happens in the global trade arena is of great concern. For example, the recent unilateral trade measures of the Trump administration have put the future of an open multilateral trade system at risk. All countries could face a serious threat to their economy. However, trade is only one part of recent trade agreements. They also involve services, investment policy, government procurement, state-owned enterprises, intellectual property, electronic commerce, even labour and the environment. The way these issues are defined and treated in trade treaties has made them controversial as they have serious implications for development overall. For example, there was a lot of public unhappiness and protests over the the Trans-Pacific Partnership Agreement (TPPA), which Malaysia signed. As the United States pulled out after Trump became the president, the remaining 11 countries reworked the TPPA into a new CPTPP (Comprehensive and Progressive Agreement for Trans-Pacific Partnership), which Malaysia has also signed, but not yet ratified. 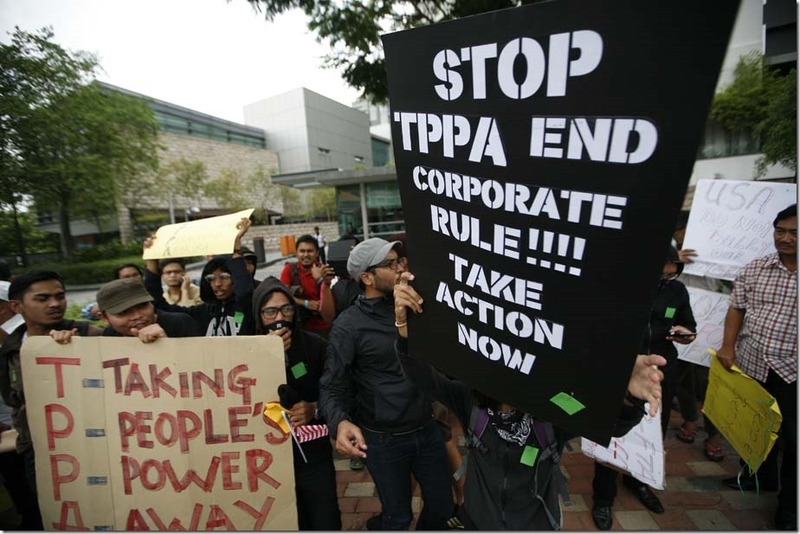 The CPTPP is much like the original TPP. As such the main controversial aspects remain and will complicate and restrict the freedom and space of the Government to formulate, establish and revise policies. Firstly, the investment chapter requires large opening up of the economy to foreign investors, including not only companies with long-term direct investment interests but also short-term investors to enter and establish themselves in competition with local investors. Performance requirements such as technology transfer or use of local management and labour would be more difficult to require as conditions. The CPTPP also sets up an investor-state dispute settlement (ISDS) system, whereby foreign investors can sue the government in international tribunals by claiming they did not receive fair treatment, or that they lost future profits because of a change in government policies. In some cases, tribunals have awarded the investors hundreds of millions or even more than a billion US dollars in compensation. This same ISDS system is used in many bilateral investment treaties. Many countries suffered losses from claims made by foreign investors in tribunal decisions seen as biased. Indonesia, India and South Africa are among countries that have pulled out of their investment treaties. Even the Trump administration is having second thoughts about ISDS. Secondly is a chapter on government procurement. Like most countries, Malaysia gives preferences to local companies when it buys supplies or undertakes projects, big and small. It is a crucial tool to encourage local companies and also boost the domestic economy, through increased spending and its multiplier effects. With CPTPP, preferences to locals are seriously curbed. Foreign firms and contractors of CPTPP countries will be treated the same as locals, except for lower levels of project costs, in listed government ministries and agencies. Through time, loss of business by local companies can be expected. Thirdly is a chapter on state-owned enterprises (SoEs), whose aim is to change the terms under which SoEs operate, for example, making it more difficult for them to obtain government loans and equity. Their procurement should be open equally to foreign firms of the treaty’s countries. The ultimate aim of the main advocates of this issue is to phase out SoEs, which are often the main competitors of the large companies of these developed countries, so that they can obtain more market share in the domestic economy. True, there are many things wrong with some government-linked companies in Malaysia. The atrocious record of 1MDB and Felda for example gives a very bad name to GLCs, and we must make sure their abuses and crimes are not repeated. There are however several GLCs that have gone through a reform process, are performing reasonably well and are a valuable part of the economy. It would be wrong to throw out all the babies with the bath water. Some exceptions are given for the bumiputra policy in the CPTPP, but these are not enough to offset the loss of policy space caused by the treaty overall. Fourthly is a chapter on intellectual property, which provides even stronger monopoly privileges to owners of patents and copyright, which are mainly foreign companies. It will be easier for drug companies to obtain and further extend the term of patents (which are normally for 25 years under WTO rules) for medicines. The cost of an effective Hepatitis C medicine which is patented by an American company was originally over RM300,000 per patient. The previous government issued a compulsory license under a government order to facilitate its providing an alternative generic medicine at a cost of less than RM1,000, thus giving hope to the half million Malaysians with Hepatitis C that they can be treated. The CPTPP also requires Malaysia to sign on to an international treaty, UPOV 1991, under which Malaysian farmers would be obliged to pay for the seeds they use if these are protected, instead of being able to save their own seeds to plant in the next season. This would increase costs for farming, and it would also overthrow the existing good Protection of New Plant Varieties Act. Finally is the trade component. The main benefit of the TPP, which is access to the vast US market, is not available as the US is not in the CPTPP, yet the country has to absorb the same adverse effects of other issues. Some studies have shown that the TPP would have resulted in a negative trade balance (increase in imports exceeding exports) for Malaysia in the TPP and it is likely the country would not gain in these net terms under the CPTPP too. Other studies, including by Prof Jomo Sundaram, have also shown that the trade benefits of FTAs including the TPP tend to be exaggerated due to unrealistic assumptions used in the models. Since Malaysia has to reduce all its tariffs to zero, local firms and farmers will face stiff competition from cheaper imports, and a number may lose market share or even close. Given the serious issues involved, it is wise for the government to review its participation in the CPTPP. Meanwhile the 18 changes to the laws that are being prepared to enable the country to implement the CPTPP should be put on hold. Attention to the CPTPP is important as it could well be the template for other treaties in future. Malaysia is currently negotiating many other trade agreements, including the Asian regional treaty RCEP (Regional Comprehensive Economic Partnership), and a Malaysia-European Union FTA. The scope for these two are also broad: the first also includes investment; the second may include all the TPP issues. They should also be reviewed.There is also need to review developments at the WTO. Here, an immediate priority is to oppose the unilateral US trade actions like the ones and reaffirm multilateralism. Also, Malaysia should assess the implications for our economy of proposals in current negotiations, mainly led by Western countries, to introduce new topics like e-commerce and domestic regulations, and take positions accordingly. As trade negotiations are no longer just about trade per se, it is important for a review to be made on trade agreements and negotiations from a strategic perspective that includes development policy overall, industrial development, services, agriculture, the interests of local firms and farmers, the rights of consumers and workers, jobs and livelihoods, and healthcare costs. Decisions on whether to join an agreement, its scope and terms, the negotiations and the trade-offs that are to be made, and whether to sign on or not, should not be left mainly to one or a few ministries but should be the concern of a high level inter-Ministerial committee or council, preferably chaired by the Prime Minister. Moreover, the parliament and state governments should be part of the decision-making process. And, equally important, stakeholders including civil society groups should be informed, consulted and given participation roles.